Shop at H-E-B supermarket and browse the Heb Weekly Ad for deals like weekly low prices, fresh produce, frozen food, BOGO deals, big pack discount, and coupons. To beware of all the weekly ad discounts or other kinds of price drops, it’s the best way to view the ad. They also offer multiple-buy discounts such as “buy x save y”. Visit this page every week to get your deals. A huge part of the trade of H-E-B operates in Texas. Digital coupons are an important part of the discounts on weekly sales of Heb. You can get something even for free using the coupons matching up to them with the other deals. Create your own shopping and deals list to save the maximum amount of money from the weekly shopping at H-E-B. Hundreds of coupons can be in use from time to time. There is also a pharmacy, gift cards, and eGift cards of Heb Supermarket. H-E-B has 350 stores operating in Texas and northeast Mexico. Their product range is generally grocery, deli, frozen food, meat, pharmacy, snacks, seafood, and similar supermarket departments. 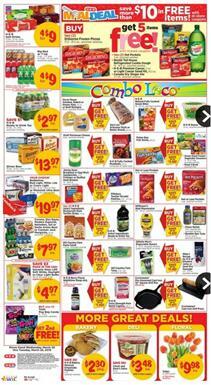 Combo Loco deals of Heb Weekly Ad is the greatest savings at your local store. A lot of BOGOs are available there. Restock sausage, cheese, pasta salad, sleep-aid pills, and more products with those BOGOs on the first page. HEB also offers deli, bakery, and floral sale. You can buy H-E-B bakery Mexican empanada pastries for only $2.30. The deals have only 2 days left. Act quickly to save on these items. 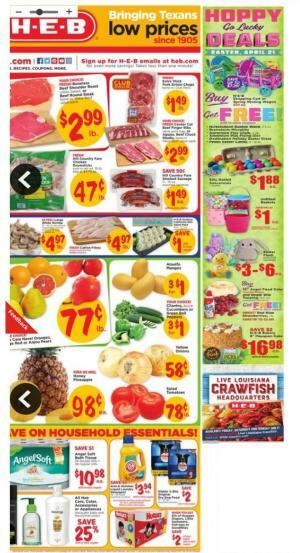 Nevertheless, tomorrow or on Wednesday, you will probably have a new HEB Ad which will be full of more deals. Not for the same products of course. If you want to buy some frozen pizza, DiGiorno pizzas will give you 5 free items. Buy 2 of the frozen pizzas to get some nice snacks and soda for free! Bulky buys are really important savings at HEB Stores. Soft drinks, soda packs, and some candies are sold in big packs so you can get more for cheaper prices. Stock up to save more in stores like H-E-B.